I’ll try to intersperse a few Alaska photos in here with all the photos from Chile. It’s still only April and already I’m champin’ at the bit to get to Alaska and back in to Wrangell St. Elias National Park. Last year in September I had an opportunity to do some aerial photography of these mountains and it was absolutely awesome. I did a flight in the morning and another in the evening. This photo was taken on the 2nd flight, where we flew south from McCarthy towards Mt. St. Elias and Mt. Logan, the 2 highest peaks in the region. Mt. St. Elias is the highest peak in Wrangell – St. Elias National Park and stands 18,008 feet (5,489 metres), whilst Mt. Logan, the highest peak across the border in the Yukon Territory, Canada, stands 5,959 metres (19,550 feet) ASL – due to tectonic plate action, Mt Logan is actually getting taller. Mt. Logan reportedly has the largest base circumference of any mountain on Earth. It also has the coldest recorded temperatures on earth, outside of Antarctica, at -77.5 degree C (-106.6F). Mt. St. Elias actually rests on the US/Canadian border, and is the second highest mountain both countries. The native people of the area, the Tlingits, referred to the mountain as [i]Yaas’éit’aa Shaa[/i], meaning “mountain behind Icy Bay”. Sometimes the Yakutat Tlingit referred to it simply, though aptly, as [i]Shaa Tléin[/i] “Big Mountain”. Mt. St. Elias is one of the highest peaks in the world that sits in such in such proximity to tidewater. the summit of the mountain is only 10 miles from icy Bay. As such, it has as great a vertical relief as any mountain on earth, including Denali (Mt. McKinley, and the even the highest peaks in the Himalays). The weather was gorgeous and I had a killer time shooting these mountains. The pilot, Don, is someone who I’d flown with a number of time before, as he often does the backcountry drop offs and pickups for my backpacking trips in Wrangell St. Elias National Park. Don’s a great guy, and an incredible pilot. Working with him whilst I was shooting was a real treat. He’d always check with me that we were at the right altitude for a fly by, or that we weren’t too close to a mountain, or to make sure I was ready before we flew into position. I didn’t even think to ask this stuff until he would ask me. And it made a huge difference to the images I was able to create. This photo was taken above the Bagley Icefield, the largest non-polar icefield in the world, which runs kinda west from the base of St. Elias. The Bagley is approximately 160 miles long … that’s one helluva long glacier! 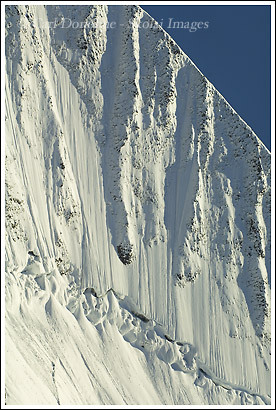 We were flying along above the Bagley and I saw this wall off to the side, and knew instantly the shot I wanted. I told Don where I wanted to be, and described what the shot I wanted to make would be, and he puput me perfectly in place, slowed the plane down (we’d been going close to 170 miles per hour), I opened the window, and clicked the shutter. This is one of my favorite images from all the landscapes I’ve taken. Thanks Don! In fact, I like this one so much I have a 12″ x 18″ print hanging in my home, and I also made a black and white vesion of the image. Here is the black and white version of the photo. More photos from Wrangell – St. Elias National Park. This entry was posted in Aerial Photos, Alaska, Canada, Landscapes, Wrangell - St. Elias National Park on April 28, 2007 by Carl D.